Central Embassy is situated along the forever busy Sukhumvit area in between Chit Lom and Ploem Chit BTS stations. It is nested nicely in the middle of Bangkok’s premium shopping district, with one end at Siam BTS station where Siam Paragon, Siam Center and Central World are, and the other being Phrom Phong BTS station ending with The Emporium and the very recently opened EmQuartier. It houses mostly haute couture boutiques by the major fashion power houses from France and Italy, though we do see some internationally renowned Thai labels as well. The 5th floor of the shopping mall section comprises of restaurants offering a good variety of cuisines like Japanese, Chinese and Thai of course. 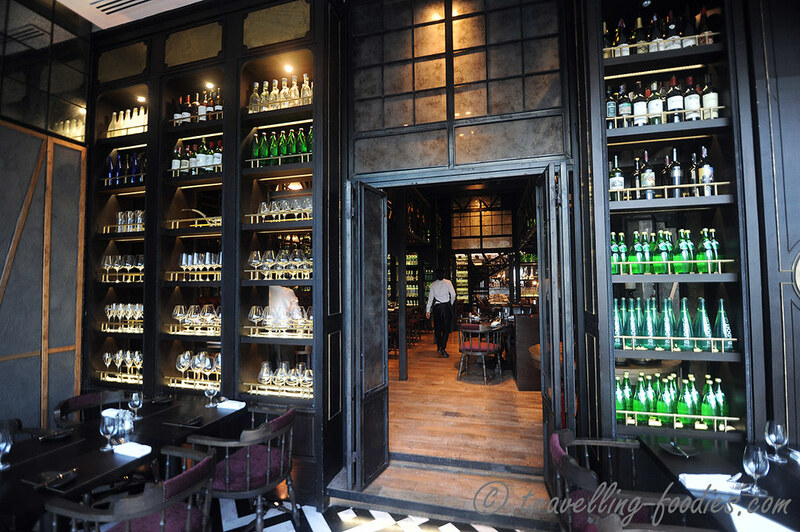 Aptly named the Water Library, one is first overwhelmed by the decor, dark, lush but not short of being cosy, with bottles of wine, liquors, sparkling water and drinking glasses racked up all the way to the ceiling, reminiscent of a probable Parisian casual dining scene in the not to distant yesteryears. 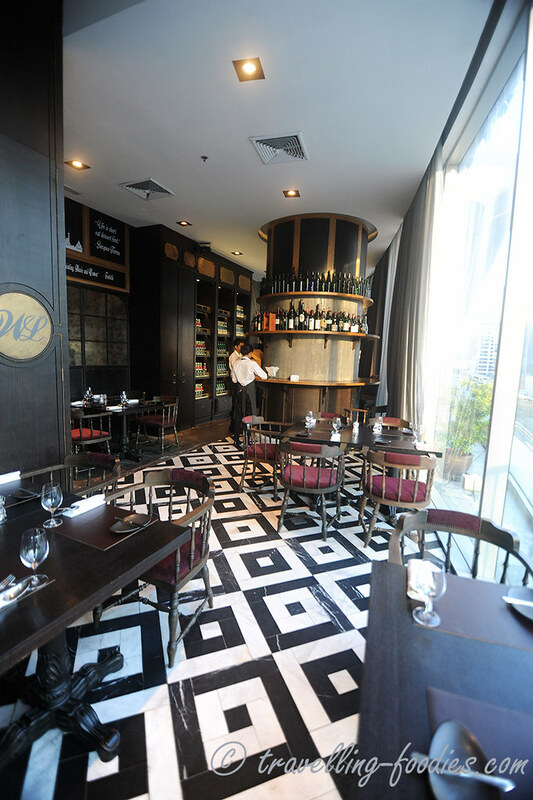 The choice of vintage-looking dark wood furniture against the classic black and white bistro-styled tiles instils a chic 19th century French charm and helps to pace the mood beautifully for the dining experience. 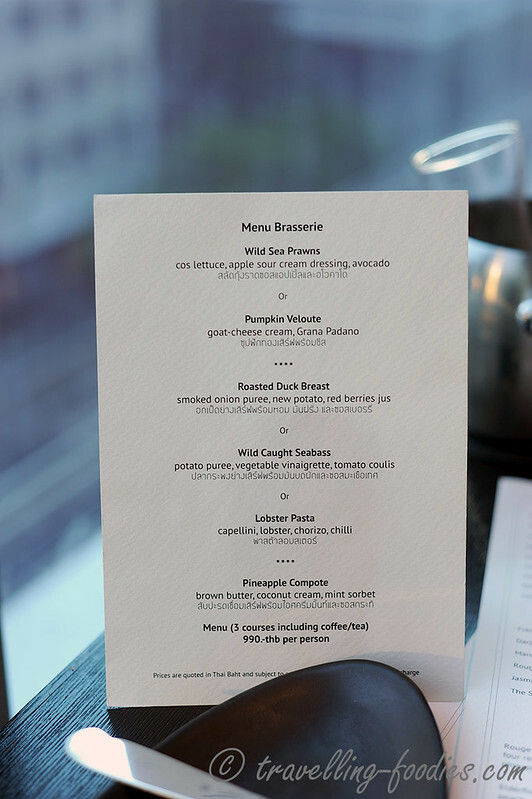 The Water Library Brasserie @ Central Embassy offers a standard three-course Brasserie menu, with choices for the entree, main and dessert. 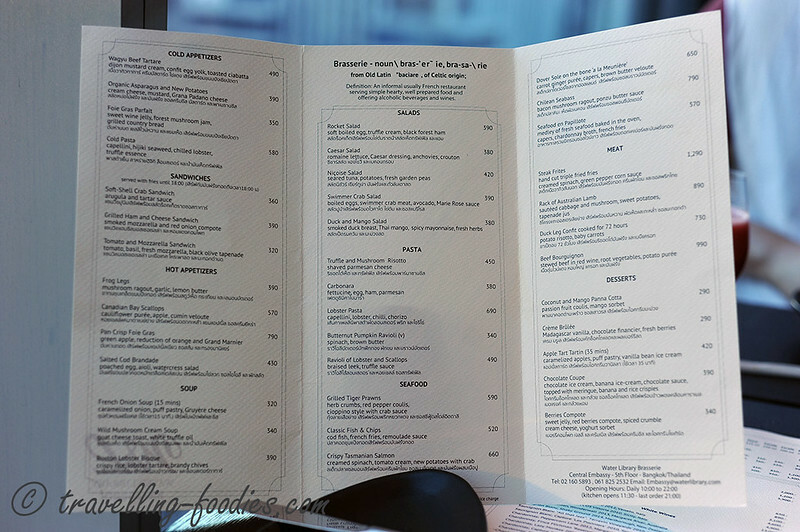 We decided to go for their signatures instead from the main menu, which was rather extensive with tough decisions to be made. 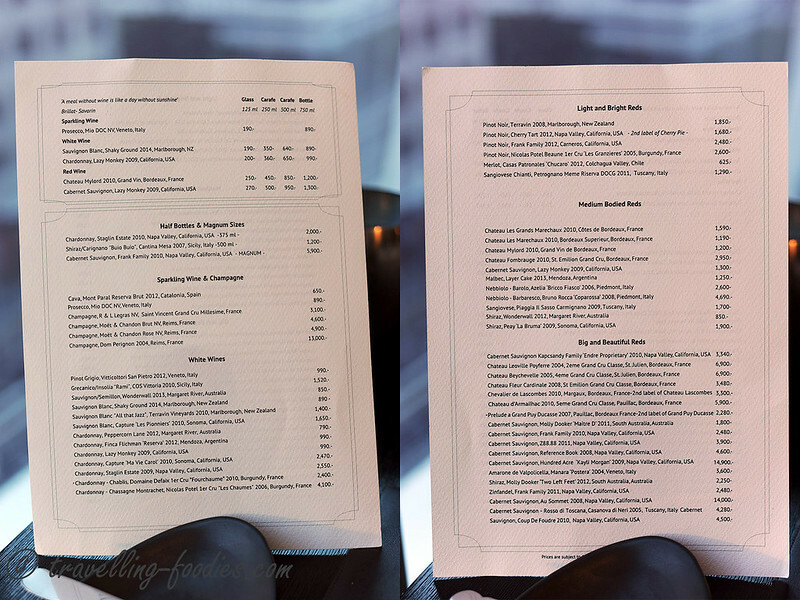 They also have a rather decent wine list, from which I’d chose a slightly dried and aged white to go with the dishes we ordered. 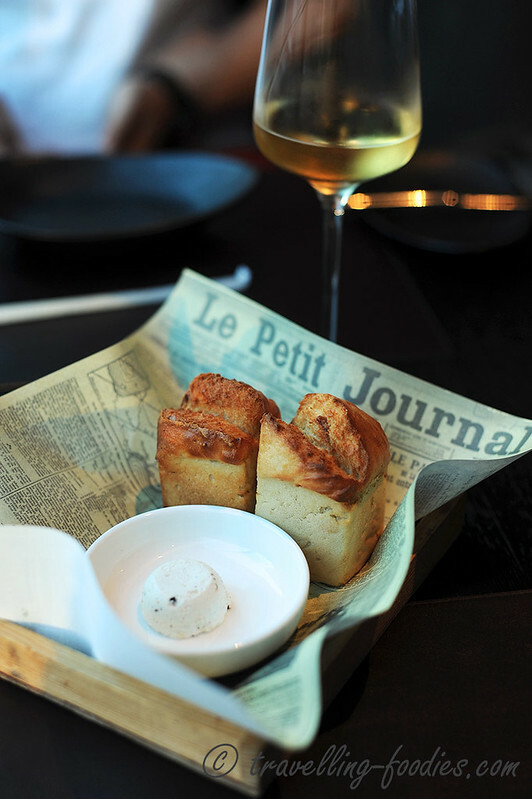 Potato bread was served with truffle butter, whipped until it is lusciously white and creamy. The bread was warm,as if it was just freshly baked out of the oven, nicely crusted on the exterior while remaining soft and pillowy inside. It was so so good that we had to go for seconds, which the maitre d’ most gladly obliged. 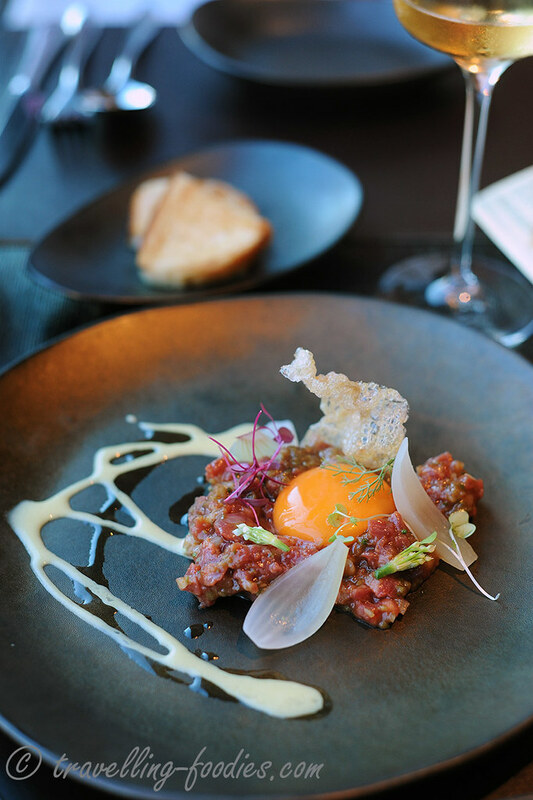 We ordered Wagyu Tartare for our shared entree, dressed in a dijon mustard cream and egg confit, topped with micro greens. 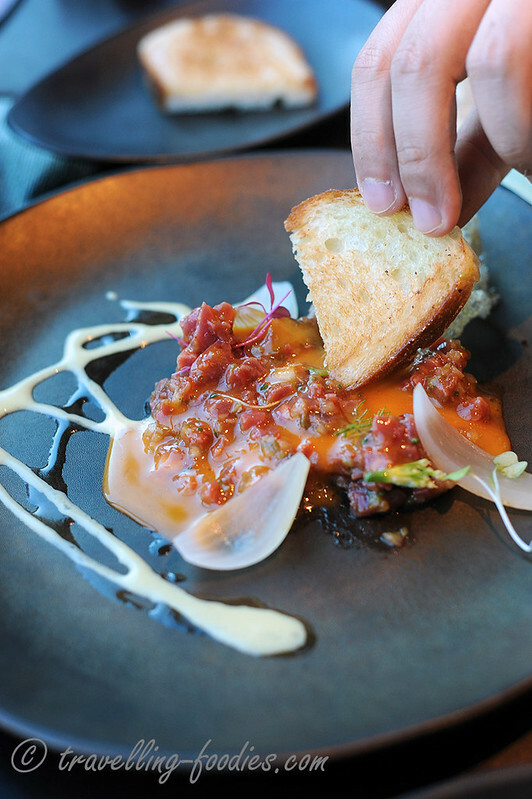 The tangy and slightly spicy sauce nicely worked up one’s appetite for the meal while the egg amalgamated the beef tartare and sauce, working everything together into a luxurious dipping spread for the toasted ciabatta and thin wedge of crackling that were served alongside. We happily lapped up any remnants of sauce from the plate with the potato bread after the ciabatta is done, all the more reason to ask for more bread! Ravioli of Lobstser and Scallops for our first main. 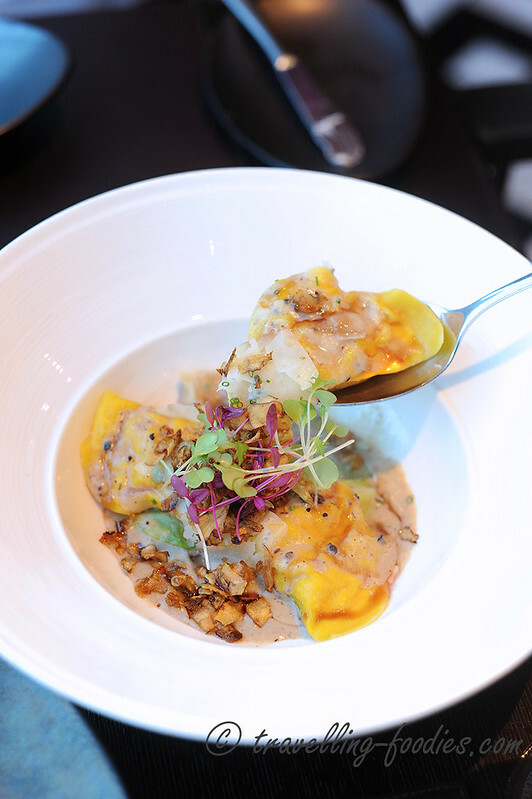 Three generous pieces of ravioli wrapped with a pasty mousse concocted from the shellfish which provided the umami lift of the dish that complimented the truffle sauce that went along. All this was rested on a bed of braised leek, topped with morsels of what seemed like a combination of fried garlic and bacon. While the truffle sauce was good, the filling of the ravioli was slightly on the drier side than what I would have liked. Texturally, I would probably have preferred some bits of chopped seafood added for contrast instead of everything being monotonously pureed. The leeks could probably have been grilled slightly before braising to lend an additional smokey dimension and also help to draw out the sweetness from it, but overall the flavours were good. 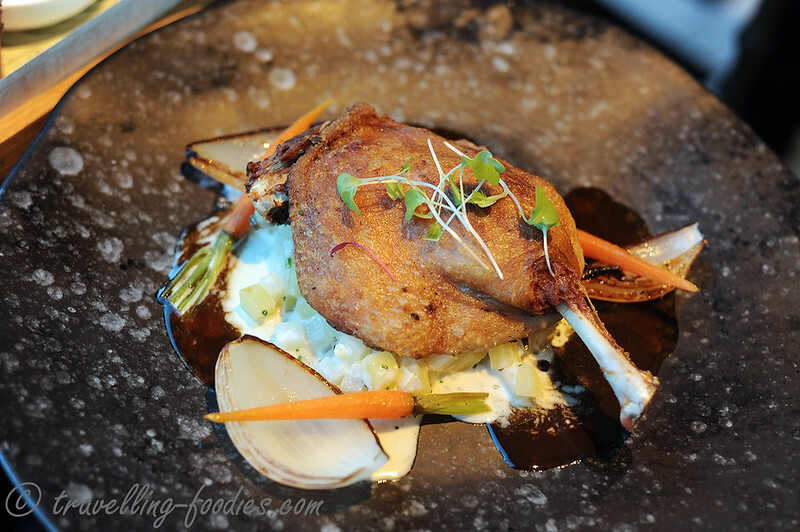 Our second shared main was the Duck Leg Confit, a classically French dish and the restaurant’s signature. This was definitely the star of the evening, the skin uber crisp while the meat was delightfully meltingly moist and fork tender. It was rested on a bed of miniscule new potatoes cubes which had been cooked in a light bechamel-like sauce until they are just done, retaining quite a bit of texture, without being too soft or mushy. The execution was impeccable, A must order. 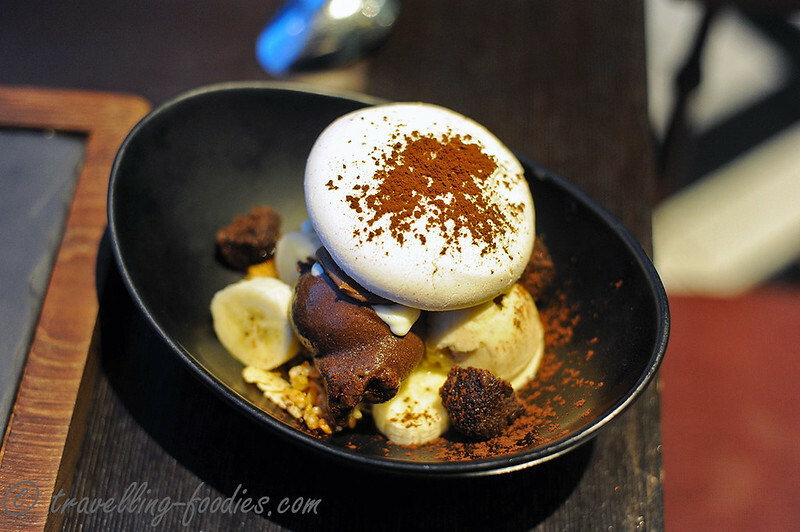 We ordered two desserts to share as well, Chocolate Coupe being the first, which comprises of banana ice-cream, chocolate ice-cream, chocolate mousse, fresh banana, ganache and sugar coated rice crispies and a dollop of baked meringue shell dusted with cocoa powder. It was good but not quite “frenchy” as we would have expected. The bits of chocolate cake and a cream which seemed like a cross beftween peanut butter and salted caramel was yummy. We loved the crunch from the rice crispies against the rich and moist chocolate cake, but we are not entirely sure what the fresh bananas are doing in the dessert though. 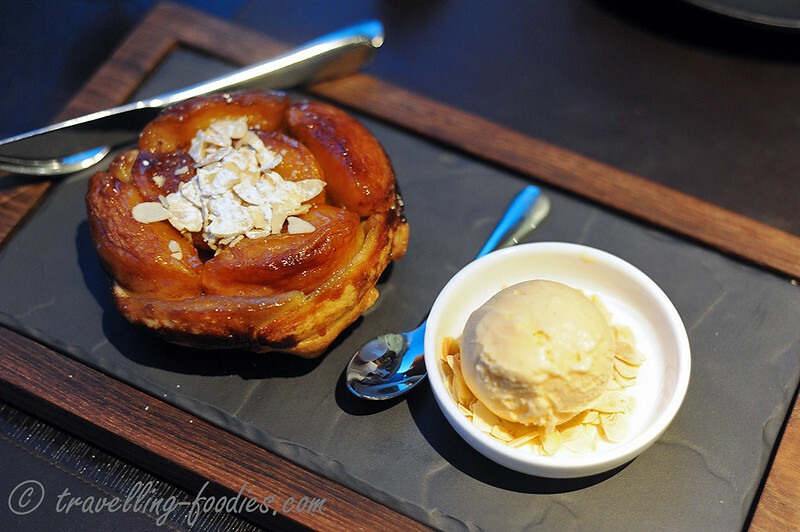 Tarte Tartin, classically French signature of caramelised sour apples with puff pastry, topped with lightly toasted almond flakes and served with vanilla ice-cream. This was absolutely delicious. The apples were beautifully poached and then caramelised, with an intermingling of the tart flavours from the apples and slightly bitter caramel which I personally enjoy very much. The puff pastry was very well done, crisp and well-baked throughout without any bit of softness within. The vanilla ice-cream too was really yummy, vis the banana ice-cream in the previous dessert. 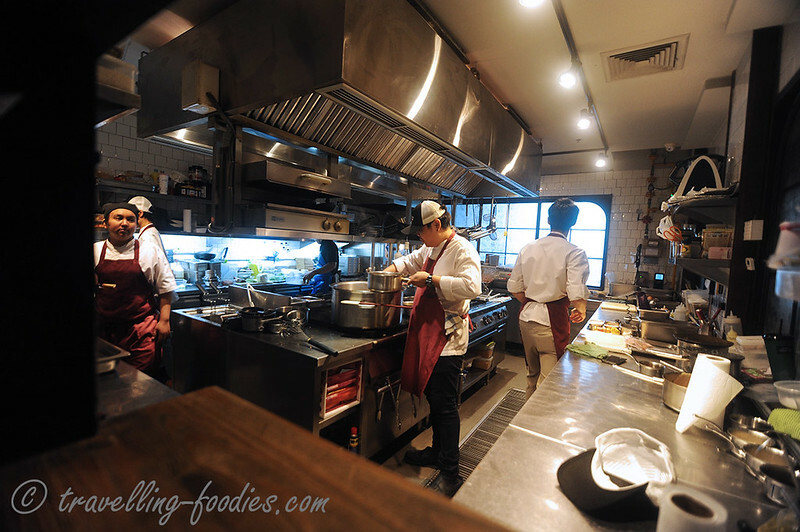 A peek into the kitchen as the sous chef whips up our meal with his team. The food is good and more so was the ambience, most certainly worth more visits to sample other dishes from their menu. 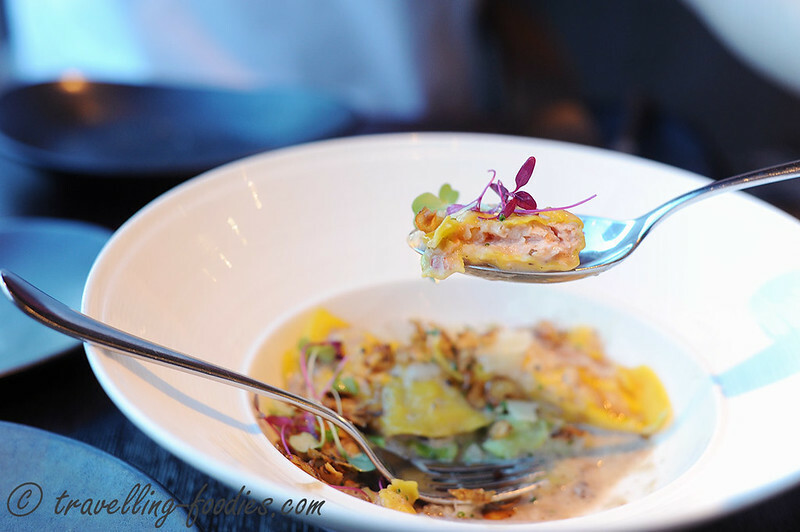 This entry was posted on November 19, 2015 by Alan (travellingfoodies). 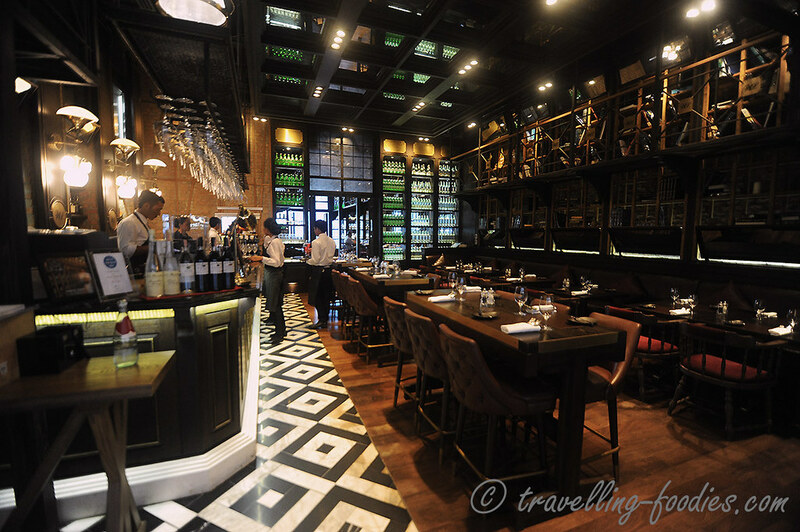 It was filed under Food, Travel and was tagged with bangkok, central embassy, chef haikal, dessert, duck confit, fine dining, french, french cuisine, meringue, ravioli, tarte tartin, wagyu beef tartare, water library brasserie.